Walking and cycling can be cheap and efficient. Use the map above to find secure spots to park your own bike, or to locate the nearest London Cycle Hire scheme bike to rent for short journeys. Many London bus lines pass close to City sites. Sometimes it's hard to know which one is best to choose, so here are some ways to help you. Our part of London is well-served by the Northern Line (City branch), as well as the combination of the Circle/District/Metropolitan/Hammersmith & City lines, and by the Central Line. 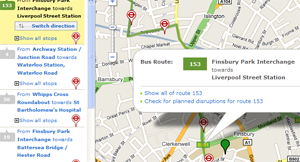 Use the widget on the right to start planning your journey using TfL's journey planner. You can check National Rail Enquiries' live departure boards for any UK station to see if trains are running on time – you’ll know if you have time for another coffee. Parking in the roads surrounding The City Law School is at parking meters. The nearest National Car Parks to the Inns of Court School of Law are Selkirk House, Museum Street or International Press Centre, Shoe Lane. Please note that the majority of City sites are within the Congestion Charging Zone. For Congestion Charge information please see www.cclondon.com or the travel information on individual maps. minutes and the journey takes about 45 minutes. View the campus map or download CityNav.